Louis Simpson has been enriching the tradition of poetry in English for over 60 years, from his eloquent poems of the Second World War to the later understated, sometimes dyspeptic, tales of contemporary suburban life. He is one of the few poets of our time to have kept the art of narrative, of story-telling, alive in poetry, and yet he has done so without any sacriﬁce of lyric power: the work in The Owner of the House enchants and disenchants in equal measure. These conversations with America, held over many decades, are informed by a melancholy clear-sightedness, a generous, wry sense of humour, and a determination to celebrate the true lives and capacities of ordinary people. If Chekhov were reincarnated as a poet into the world where we live, this is surely what he would sound like. and a man trying to repair it. stares back at the freeway trafﬁc. let down in the middle of the road! To think that their car would do this! whose son has gone against the law. and the robber goes skulking back to the trees. it’s theirs, they’re stuck with it. and see the world go whizzing by. as they thought they were. through no fault of your own is common. That’s why I say, an American classic. And yet you won’t find him with them in many of the main anthologies of or covering modern and contemporary American poetry. He’s not in Helen Vendler’s Faber Book of Contemporary American Poetry, J.D. McClatchy’s Vintage Book of Contemporary American Poetry, Geoffrey Moore’s Penguin Book of American Verse or the Norton Anthology. He’s ‘not one of us’: Vendler being Harvard, McClatchy Yale, Moore the editor of Henry James and other classics. Helen Vendler’s anthology only covered 35 poets, so Simpson’s failure to make her top team is more understandable. But J.D. McClatchy’s book is supposed to represent ‘sixty-five of America’s greatest contemporary poets’. Sandy McClatchy doesn’t pick mavericks like Bly or Dorn either, but Simpson was not a maverick but an outsider, an outsider who viewed America and its people from the inside. 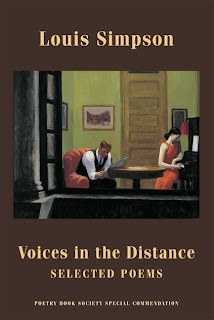 The poet John Hollander mentioned by Simpson is one of McClatchy’s approved poets, and he is in the Vintage anthology. Literary mafias play their part in establishing and furthering the reputation of poets in America as everywhere else, and anthologies are amongst the most effective ways critics have of pushing whatever their preferred canon happens to be. Louis Simpson admires the work of the great Modernist poets and established his reputation as a critic with a book called Three on the Tower (1975), a study of Ezra Pound, T.S. Eliot and William Carlos Williams. But he isn’t a Modernist poet himself – or a Postmodernist – and so isn’t in their anthologies either. But he is included in Donald Hall’s Penguin Contemporary American Poetry. And he edited – with Donald Hall and Robert Pack – an anthology which was to make a significant impression on both sides of the Atlantic, The New Poets of England and America (1957), although later editions of this anthology remove his editorial credit. 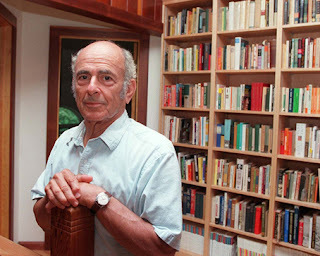 He’s also in one of the standard American poetry textbooks, A. Poulin, Jr’s Houghton Mifflin anthology Contemporary American Poetry (eight editions from 1971 to 2005), which meant his work has been read in American schools and colleges. Poulin (1938-96) taught at SUNY at Brockport where he founded BOA Editions in 1976, and went on to publish Simpson’s 1983 Selected Poems, People Live Here, which was later published in Britain by Anthony Thwaite, Secker & Warburg’s poetry editor, in 1985. Three of his collections had earlier been published in Britain by Oxford University Press, from 1971 to 1980, including Searching for the Ox and Caviare at the Funeral, but after that Secker Selected in 1985 he had to wait another 25 years – until this year – before he was published in Britain again, with a new selection, Voices in the Distance: Selected Poems, published by Bloodaxe in 2010. When I was making the selection for this edition, I could hardly help not noticing that I was selecting poems from 18 collections published from 1949 to 2009 by 12 different publishers, the first of them being the poet himself. Thom Ward, who took over the BOA list from the late A. Poulin, brought Simpson back to BOA with The Owner of the House: New Collected Poems, 1940–2001, which was shortlisted for the Griffin Prize in 2004, and BOA published Simpson’s final collection, Struggling Times, in 2009, but BOA isn’t one of the heavyweight New York publishers whose support carries weight with the poets, reviewers and academics who control critical opinion in the US. With its list now edited by Peter Conners, BOA has picked up on many marginal or marginalised voices, and too often sees the poets whose reputations they can help establish get whipped from them by the likes of Norton. And looking through the list of Simpson’s previous US publishers, you don’t see names like Norton, Knopf, Farrar Straus, Viking Penguin. Many of the major American poetry lists have or have had editors who are part of or are connected with the American literary and academic establishment or other literary power bases. Simpson moved – or was moved on – from publisher to publisher, which can’t have helped his visibility. Much of Simpson’s subject-matter is quintessential America. The language of his poetry draws on American speech and American speech rhythms. my loves that were slender as gazelles. dream, you are falling in Asia. as the American army enters. from my life, in a foreign country. These people are speaking a strange language. and strange, I think, even to themselves. 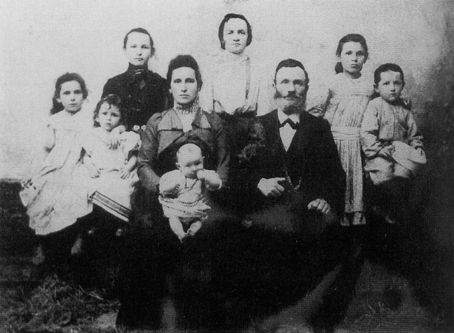 The Marantz family in Lutsk, Russia, c. 1905. To the left: Louis Simpson’s mother Rosalind. Her mother Pearl is in the centre with her second husband Lazar. Louis Simpson’s father Aston Simpson in the Jamaican Reserve Regiment, c. 1914. 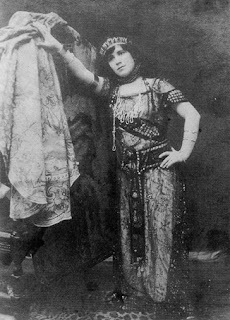 His mother Rosalind de Marantz as an aspiring opera singer, New York City, c. 1914. 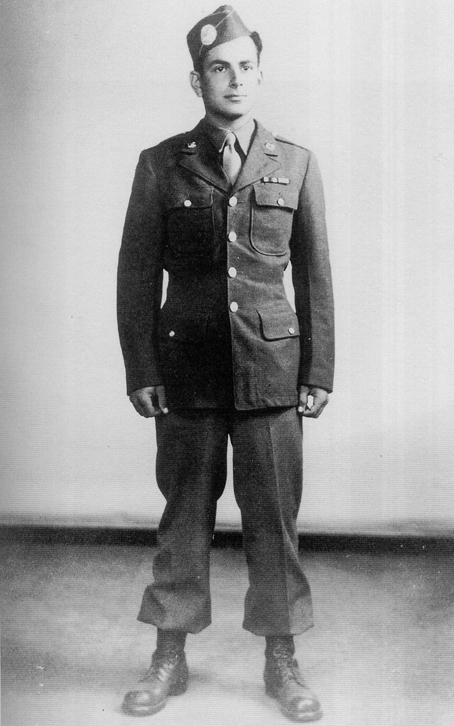 Louis Simpson was born in Jamaica in 1923. His father Aston Simpson was one of the leading lawyers in Kingston, of Scottish descent but with mixed blood in the family line. His mother Rosalind was Russian, born Rosalind de Marantz, of Polish Jewish ancestry, emigrated to America as a child, joining members of her family who were already there. When she was 17, she was living in Brooklyn, sewing shirts in a factory in Manhattan, when she managed to get a job as an extra on a film being made in Jamaica, where he met and was courted by Aston Simpson. 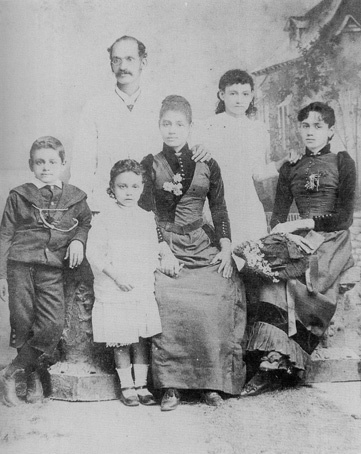 When Louis was seven, they separated and later divorced, quite a scandal at the time in Jamaican Colonial society. Then, one day, she disappeared. No one told me why. They said she had gone away… that was all. This was the great blow of my life, and it occurred in silence. I did not shed a tear…the thing was overwhelming. There is no way for a child to know that the grief he feels is not the whole of life but only part of it. This misery must be life… from the silence of those around me I took it to be so. It would have been wrong to complain. I did not think of asking my father, who surely would have known why my mother was longer with us. The matter-of-fact air he put on, going to his office and returning, implied that questions were uncalled-for, and neither my brother nor I was to ask them… that our mother’s having gone away was none of our business. my father was thinking of buying. She was holding a revolver. and took the gun from her hand. I thought she was mad. There was no future in Jamaica for a woman who had left her husband. No lawyer would take her case – they were afraid of my father. She left the island and went to live in Toronto. My brother and I were to stay with our father’s relatives, the Fletchers, and I was to go to school in Kingston. 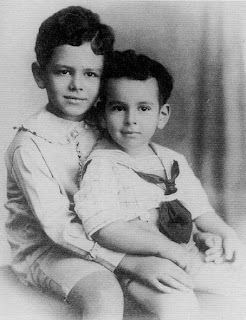 Louis Simpson with his older brother Herbert, Jamaica, c. 1927. This fable goes to the heart of the colonial situation. In Jamaica when I was growing up you were taught to think like the English. You learned English history and literature, and that you owed everything to England, and owed her your loyalty in return. But you were not English – to be English you had to have been born in England. So there was a sense of inferiority built into the colonial psyche. Simpson was sent to Munro at the age of nine, and he wasn’t to leave there until he was 17. When our father died and the will was read my brother and I had been disinherited. He had left us a few hundred pounds – the rest of his large estate went to our stepmother. She had arranged matters so, and the day after the funeral she sent us packing. When I came to New York I discovered that my mother was a Jew and therefore, according to Jewish law, so was I. My grandmother spoke English with a Yiddish accent. She was very religious. I can see her lighting the candles on Friday night, bringing her hands to her breast and praying in silence. A few years ago she had made a trip back to Russian, bringing clothing and money that she distributed, enabling some young people to marry. But her daughters had shed their religion in mid-Atlantic. They had given up their Jewish traditions and been assimilated, but only on the most superficial level. Every Friday night members of the family fathered at my grandmother’s apartment in Brooklyn: my mother’s younger sisters, Ruth and Annette, her niece Dorothy and brother Joe. My mother was usually absent; she was traveling, demonstrating cosmetics for Helena Rubenstein… at first in the States, then in South America. …not to let anyone know that I came from Jamaica – I was to say that I came from England. She did not give a reason but it was obvious: if I said I was Jamaican people would think I was colored. It did not seem to occur to her that this advice might make me think there was something I should be ashamed of – which it did. For years I felt uneasy about having been born in Jamaica. It did not occur to my mother that it was wrong to tell me to lie. Fortunately all my training had been in the other direction: I grew up thinking that to lie was a sin…unforgivable. I did not take her advice – and it made me dislike her. I thought that in her business, cosmetics, she was continually lying about the products she sold, saying they would make women beautiful when, in fact, the face creams and “skin nourishers” were only grease. I thought she was always pretending to be something other than she was, and all her ideas were wrong. In the early 1940s she was traveling far afield in Latin America. Her talk that had been punctuated with the word “dollars,” so that I had to resist the impulse to put my hands over my ears, was now punctuated with the word “bolivars.” I was happy to return to my room in the dormitory at Columbia and the reality of poems and stories. • Literary theorists. Simpson went on to teach literature at American universities for most of his life, and his memoir includes rants against the rise of theory in academia, and those ‘who teach that there is no direct connection between words and life, only between one word and another, one “sign” and another’. Most of the professors don’t read literature, he says, ‘they’re too busy reading literary theory to read literature…’ which can only be bad news for books, reading and literature. The course, however, did not include poetry except as an adjunct to drama. 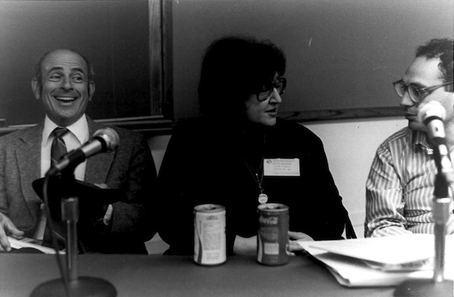 This was typical of the tastes of the faculty at Columbia. With the exception of Mark Van Doren, who was a poet, they had very little respect for poetry. What they liked was an idea that could be argued about. The teacher I had in Humanities four times a week, Lionel Trilling, typified this attitude. I don’t want to drive it into the ground, but fiction is more interesting, more alive, than most people’s lives. In the 101st Airborne Division, London, July 1944. I left Jamaica when I was seventeen and emigrated to the United States. Instead of going to Oxford I went to Columbia. There followed three years in the American army. After this I no longer thought of myself as a Jamaican, and my writing changed. Ads time passed it would change radically, so that I was regarded as an American, not a Jamaican, poet. When I was a boy, Europe presented a face like that which Prospero showed to Caliban at first: it was wise and just, and the voice in which it spoke was magic. The possessor of that voice was able to conjure up spirits to do his bidding. How could I not love him? But when I became a man this voice threatened to stifle my own. It was the voice of a ruling class, heard on the docks and in railway stations ordering the natives about. It has taken me a lifetime to forget that voice and hear the sound of my own. In the days that followed we were shelled heavily. This, and being cold is what I remember most clearly about Bastogne. Shelling is what ground troops experience most frequently in combat – this is their war. October, and the sky was turning gray. Carrying woe to Antwerp and to England. And always rained. It seemed they were never dry. Winter was in the air. Paths turned to mud. And pay the rest no mind. They lived with mud. And tried to dry their socks between two rains. They shivered in their holes. Dodd was returning on his way alone. And rainpools glimmered in the moonlit ﬁelds. There was a ﬁeld the runner loathed to cross. And the dead were mixed as they had fallen. Putrid things, never to be forgotten. Leading, it seemed, back to the company. He plunged into the darkness, blind with panic. A storm of shots erupted at his back. Clawing, and stumbled down the other side. Then, as he ran, he shouted out the password. ‘Ohio!’ like a dog drenched with hot water. His rifle fell. He left it where it was. And staggered. At his back the storm increased. He leaped. And ran across the road beyond. Snatched at him; he swerved out of its grasp. And fell. His helmet flew off with a clang. Feet were approaching. He lay still as death. ‘It’s Dodd,’ said a voice. Into the faces of the third platoon. Fisher. Others. They looked down in wonder. A few years after the war I was living in Paris as a student […]. I had still not recovered from the sar. It was no trouble to see bodies lying about in my room, one with an arm held rigidly in the air, another with a knee drawn up. There was a German officer who kept reappearing on the furniture. I had first seen him lying on a mattress outside a house in Holland – he has been carried out of the house and left on the mattress to die in comfort. Since then he had swollen so that his belly was bursting his trousers and his arms and legs extended stiffly like balloons. Now he had got off the mattress somehow and would turn up in my room at odd times, perching on a chair and looking at me. I offered him a cigarette which he refused, producing a packet of small black cigars from a pocket. Turkish, he said, which he preferred. One night I dreamed that I was walking with other shadowy figures along what seemed to be the bank of a canal, when bullets slashed the trees and shells were falling. I woke and wrote out the dream, and as I wrote remembered… it wasn’t a dream, it has actually happened. For one of the symptoms of the mental disorder that came after the war was amnesis… there were bright patches with darkness all around. How this scene came back clearly. I wrote it as a poem. I had been reading Heine’s ballads, and the poem took the form of a ballad. As it was a poem, not just memory, I was free to invent. 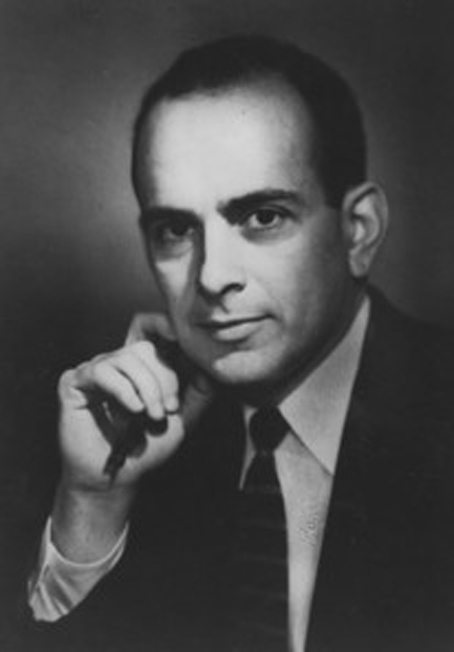 Louis Simpson in 1964, after winning a Pulitzer Prize, for At the End of the Open Road. After 1959, the publication date of A Dream of Governors, Simpson’s poetry changed. Like many poets of that time – most notably W.S. Merwin and Adrienne Rich – he became a very different kind of poet. Like Merwin and Rich, his early poetry was formal verse strongly influenced by the English classics, but the direction he took was very different from theirs. 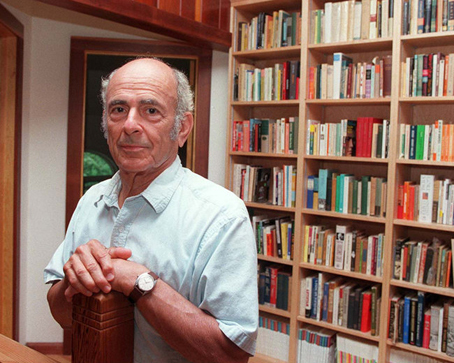 His next book, his fourth collection, At the End of the Open Road, published in 1963, won him a Pulitzer Prize. Edward Hirsch described it as ‘not only a major breakthrough in his own work; it is also one of the tours de force of American poetry in the 60s […] a sustained meditation on the American character […] The moral genius of this book is that it traverses the open road of American mythology and brings us back to ourselves; it sees us not as we wish to be but as we are.’ It was Hirsch who dubbed Simpson ‘the American Chekhov’. DO’D: Another poet who was important to you in the late sixties was the Louis Simpson of books like At the End of the Open Road. SH: Simpson had a quality of openness; he was able to give the high cultural and the colloquial equal credence, able to get at life and still keep up a literary play. Able to do that maybe because he had been in combat during the Second World War, or because he was Jamaican – somebody who had internalised a traditional British-type curriculum and then broke free of it as if it had been a chrysalis. I was also interested in the way the closed form/open form debate played itself out in his work. In fact, the drifty, soft-edgy aspect of those quatrain poems at the end of Door into the Dark probably owes something to Louis Simpson. Nothing as direct as imitation, more a tuning, an inclination to make the line a feeler-out rather than a foot-by-foot advance. I felt even closer to Louis after I went to Berkeley. He’d taught there and been a friend of Tom Flanagan’s; through Tom I eventually got to know him personally. When Tom went back east to teach in Stony Brook, they were colleagues again and I used to meet up with them in the late seventies and early eighties on Long Island. Karl Miller published a lot of Simpson’s poems also. DO’D: Louis Simpson figures in one of your own poems. SH: In ‘Making Strange’, yes. It started from a chance meeting between my father, myself and Louis. He was being driven by me from Belfast to a poetry reading in the University of Ulster at Coleraine, so I took a detour through my part of the country and stopped at the pub next to our old Mossbawn house. Next thing, my father appears on the scene, and is being included as more or less part of the tour. So there I was between the pair of them, at home and not at home, between the Toome Road and the open road. It wasn’t unlike those little poems Louis Simpson himself was writing in the 1960s, ‘In the Suburbs’, say, or ‘After Midnight’, where his own local American scene would also get itself defamiliarised. The two poets are chiming strangely: Heaney reciting all that he knew of his own country – and ‘began to make strange / at the same recitation’ – is also Simpson’s poetic strategy. Who lives in these dark houses? I might live here myself. I was setting out on a lonely road. The people my poems were about, my next door neighbors, wouldn’t read them… they preferred television. Editors blamed poets for being obscure and not writing for the common reader, but when I sent one of those editors a poem with character and incident, written in language any reader could understand, it was promptly rejected… it wasn’t “poetic” enough. Over the years The New Yorker had published a number of my poems… I had contracted to let them see my work before I showed it to anyone else. The poems I sent them now were returned and I tore up the contract. There was no precedent for the kind of poetry I wanted to write. Some years ago I had broken with rhyme and meter and learned to write in free form. Now I discarded the traditional ornaments of language, especially metaphors. I wanted to render the thing itself exactly as it happened. I discovered what writers of novels and short stories knew: if you had a point of view everything seemed to fall into place and move. Therefore the hard work had to be done on myself, understanding what I felt and what I wanted to say. Then I could tell a story and it could be believed. Now I was reading Chekhov. He knew how to tell a story about ordinary people who turned out to be extraordinary. I invented characters and placed them in Russian settings. This was the village where the deacon ate all the caviare at the funeral. and the sermon, ‘such a comfort to the family’. They crowded into the parlor. It was hot, and voices were beginning to rise. to a spoonful. Then another. ruin staring him in the face. as a lamb, et cetera. he took another spoonful, and another. a village much like ours, only smaller. Then I applied what I had learned from Chekhov to writing poems with American settings, and of course it worked just as well as in the “Russian” poems. He isn’t a religious man. on Sunday they go to sea. and all the boats there are. he heads back to shore. worn out and glad to be home. as a family ever gets. is an intellectual more or less. I too was a family man. It was a phase I had to go through. getting up at dawn to fly cast. he was carrying held him down. and was almost swept away by the current. rather than Christmas and Thanksgiving. to his dressing gown and pipe. at their incomings and outgoings. goes out on her ﬁrst date. and mourn with them that mourn. of voices from house to house. out there, beyond the stars. were walking home from a movie. tugged at her shearling coat. in the chest and throat. ‘What you do that for?’ said the other. with a parting shot at Gonzales. on top of the dying man. of this thing to the end of my days. When I first read that poem – it’s one of Simpson’s later poems, from 1995 collection There You Are – I’d assumed it was based on a news report. But it wasn’t. Simpson is recounting a shooting he witnessed himself, on the street, in New York. In 2008 I visited Simpson at his home in Setauket on Long Island with filmmaker Pamela Robertson-Pearce. We filmed him reading several poems, including the two included in the video embedded below this article, ‘A New Year’s Child’ and ‘Spot on the Kitchen Floor’, which would appear in his last published collection, Struggling Times (2009). That book was completed as his health was failing, and the frail man we met – now in his mid 80s – already seemed like a ghost of his former fiery self. While his readings of his best-known, earlier poems didn’t do them justice, he seemed to inhabit the newer poems much more fully, reading them with greater expression. Afterwards, when I asked him about the story behind ‘A Shearling Coat’, he became suddenly vehement in voicing the outrage he still felt at what he had witnessed and tried to contain in that poem. This was no fiction or fictionalised documentary, this was the real life, these were the real people he spoke for in his poetry. We have lived like civilised people. breakers of sculpture and glass. and I ask myself, where is it? a hand that enters slowly. Camus tells, of a man in prison camp. with a nail on a piece of wood. And sat there playing the piano. This music was made entirely of silence. Louis Simpson reads two of his last poems, 'A New Year's Child' and 'Spot on the Kitchen Floor', published in both Struggling Times (BOA Editions, 2009) and Voices in the Distance: Selected Poems (Bloodaxe Books, 2010). Pamela Robertson-Pearce filmed Louis Simpson at his home in Setauket, Long Island, in September 2008. 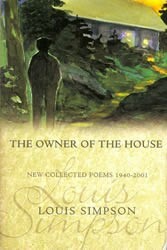 Louis Simpson reads 'A Clearing' from The Owner of the House, in Toronto, when that book was shortlisted for the 2004 Griffin Poetry Prize. This poem is also included in Voices in the Distance. The early poems are generally pretty formal, dainty and slightly constrained – though often beautiful. 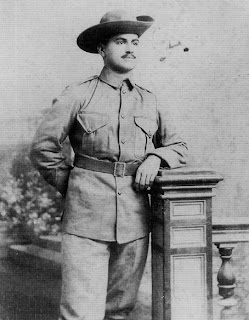 Then he produced an extraordinary long poem about his time as a soldier. In the late 1960s, the smoke blew away. His forms loosened up, his narratives turned towards quick-cutting and surrealism, his tone became more confident and confidential. The result has been 40 years' worth of work that feels absolutely compelling in its mixture of intensity and relaxation. I first started reading him 30 years ago and now hardly a day goes by without my looking at him again, thinking: how does he do that? ('The artist's artist: Five poets nominate their favourite living writer in their field'), The Guardian. Louis Aston Marantz Simpson: born Kingston, Jamaica, 27 March 1923; married 1949, Jeanne Rogers (divorced 1954; one son), 1955, Dorothy Roochvarg (divorced 1979; one son, one daughter), 1985, Miriam Bachner (divorced 1998); died Setauket, Long Island, NY, 14 September 2012. The King My Father's Wreck (Story Line Press, 1995). The Owner of the House: New Collected Poems 1940–2001 (BOA Editions, 2003). Struggling Times (BOA Editions, 2009). 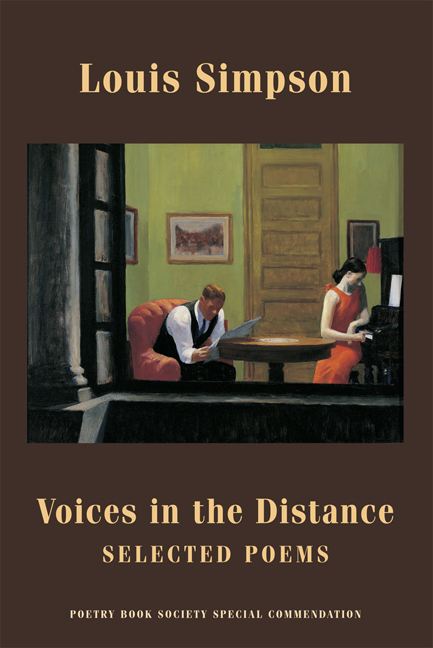 Voices in the Distance: Selected Poems (Bloodaxe Books, 2010). The above article is an expanded version of a talk I gave on Louis Simpson at Aldeburgh Poetry Festival in 2010, and thanks are due to the Poetry Trust for inviting me to compile it. The family photographs are all taken from Louis Simpson's memoir The King My Father's Wreck (Story Line Press, 1995), now out of print. The poems are from his US and UK editions listed above.